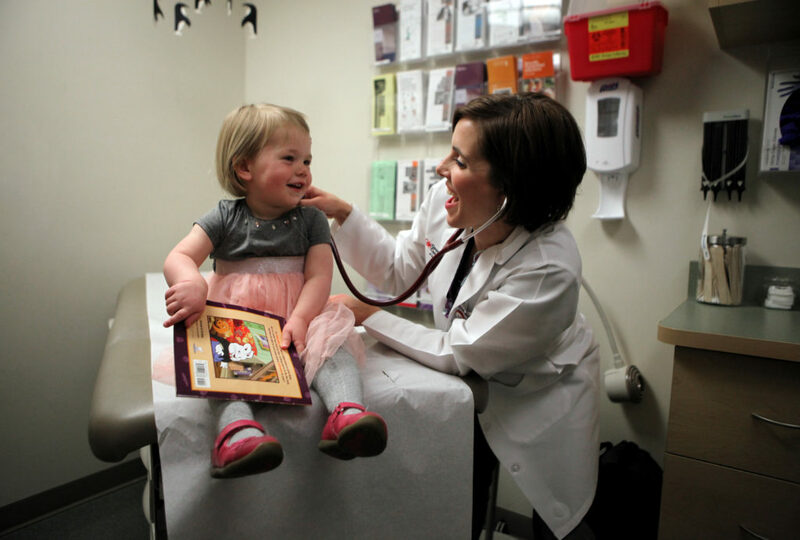 Hannah Tunney, 2, holds a book while getting a checkup from her pediatrician, Francesca Vath, APNP, at Group Health Cooperative healthcare center in Madison, Wisconsin. Group Health Cooperative participates in the national “Reach Out and Read” program which distributes a book to all children aged 0-5 at each regular checkup. The program is designed to encourage families to develop good reading habits. 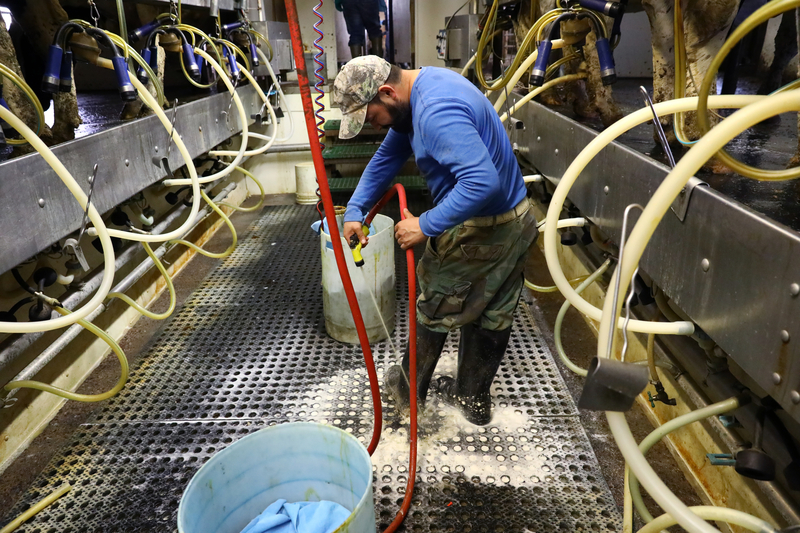 Miguel Hernandez cleans a barn on his last day of work on a Pepin County, Wisconsin dairy farm owned by Doug and Toni Knoepke on May 31, 2017. He was leaving to drive to his hometown in Mexico with four other dairy workers the following day. 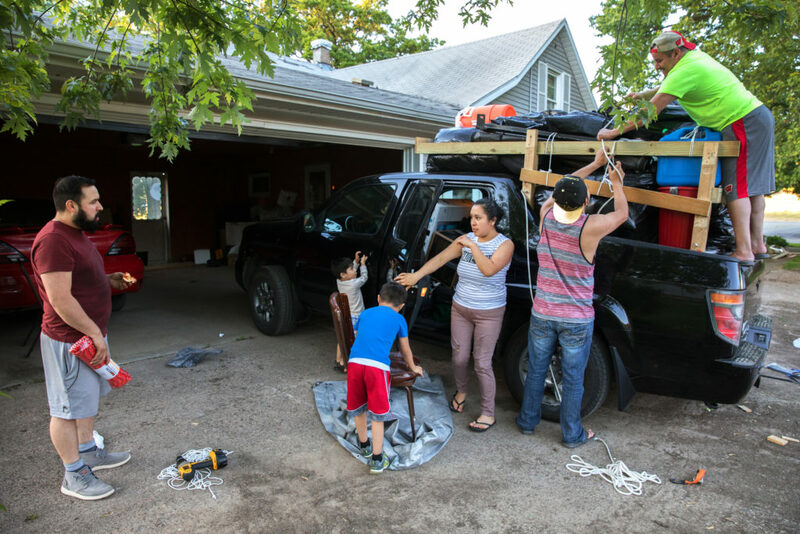 Hernandez, who is undocumented, decided to leave with his family rather than live with the fear of deportation following the election of President Trump. Immigration arrests of people with no criminal record increased by 250% in the first year of the Trump administration. 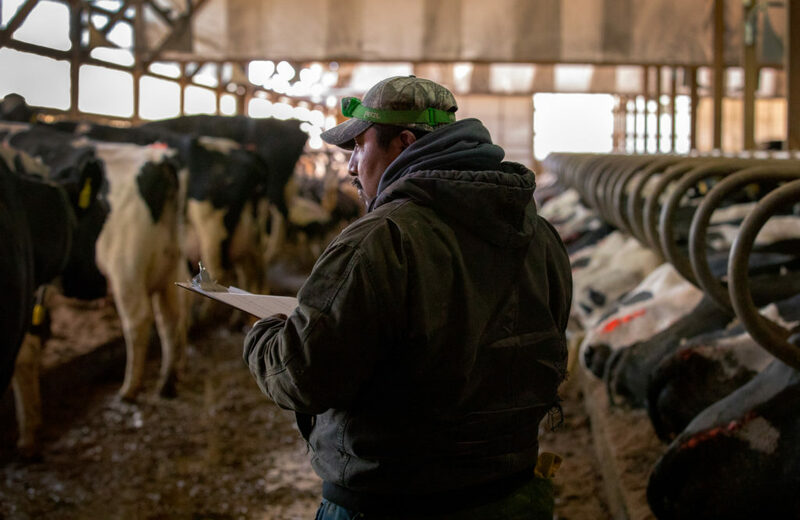 Sergio Rivera cares for the calves at Ripp’s Dairy Valley farm in Dane, Wis. Rivera is from Mexico and has been working at the farm since 2003. “Here there is more opportunities for work,” Rivera said. “In Mexico, nada.” Rivera’s wife and daughter live with him on the farm. Photo taken on Sept 12, 2017. 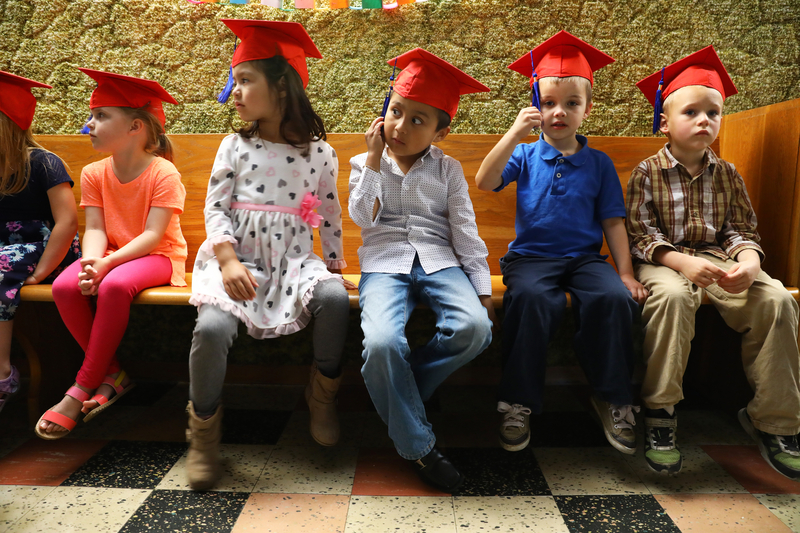 Thomas Hernandez, 5, waits in a church basement with his 4K classmates from Noah’s Ark Preschool at Assumption Catholic School before their graduation ceremony on May 31, 2017. 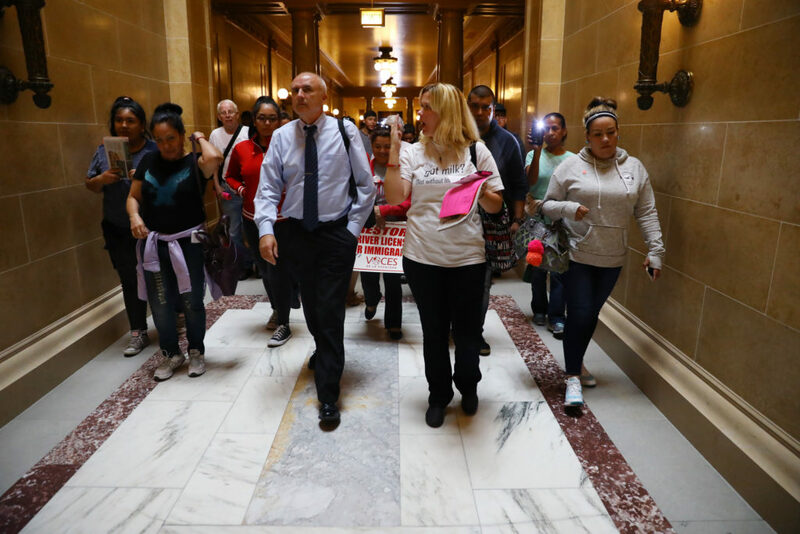 Jennifer Estrada, center right, leads a group of people through the halls of the Wisconsin State Capitol in Madison, Wis., to lobby legislators to vote against Assembly Bill 190, on Sept. 27, 2017. Estrada’s former husband, a dairy worker, was deported to Mexico in 2011. 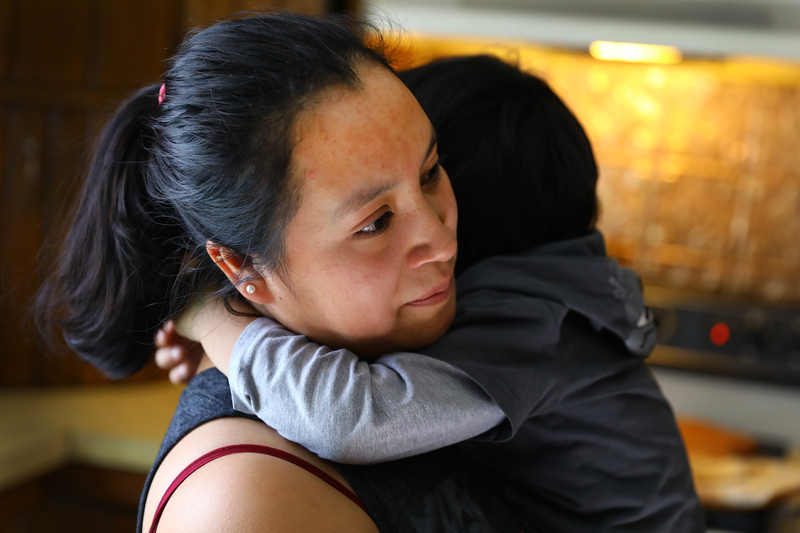 Opponents argue the bill would encourage discrimination and racial profiling in the state and potentially separate Wisconsin families through deportation. 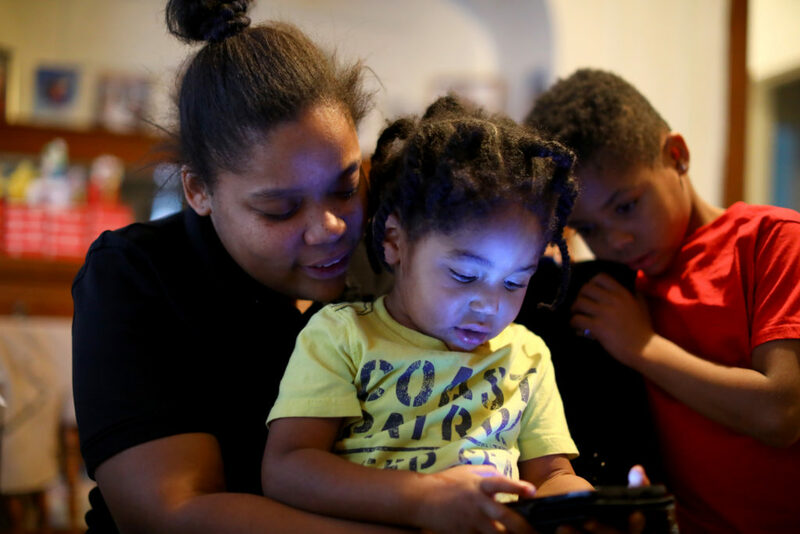 Christine Thompson plays music on her phone for her kids Dae’Lon Wofford, 7, and Daviontae Cage, 3, at their rental home in Milwaukee. The family is facing eviction in the next week or two. Thompson is a single-mom who works shifts through the employment site “Shiftgig.” She says she has enough money to pay rent elsewhere, but can’t find anywhere to rent that will accept her application. Sen. LaTonya Johnson (D-Milwaukee) greets people prior to the start of the State of the State address in Madison, WI, Jan. 10, 2017. 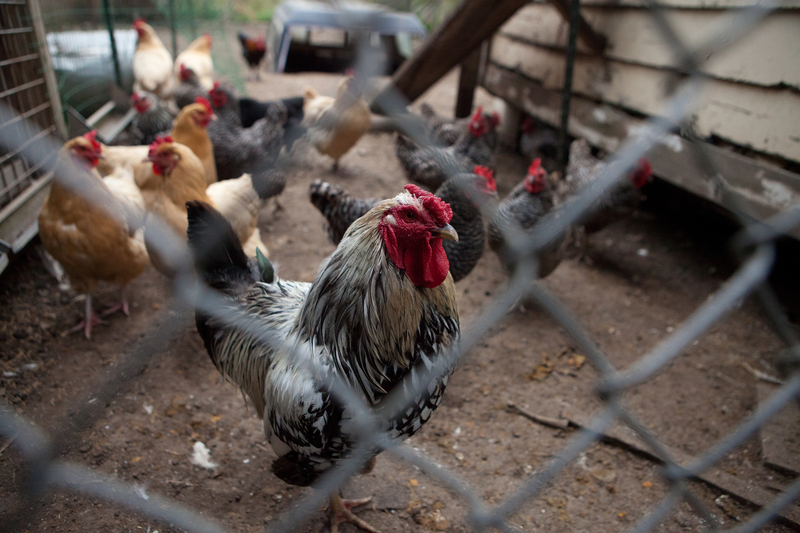 The Reeves regularly ate eggs produced by their flock of chickens, but after their well tested positive for atrazine they had to stop eating the eggs, since the birds drank the same well water. Sandra Goodwin, 56, is photographed at her home in Stoughton, Wisconsin, on March 25, 2016. 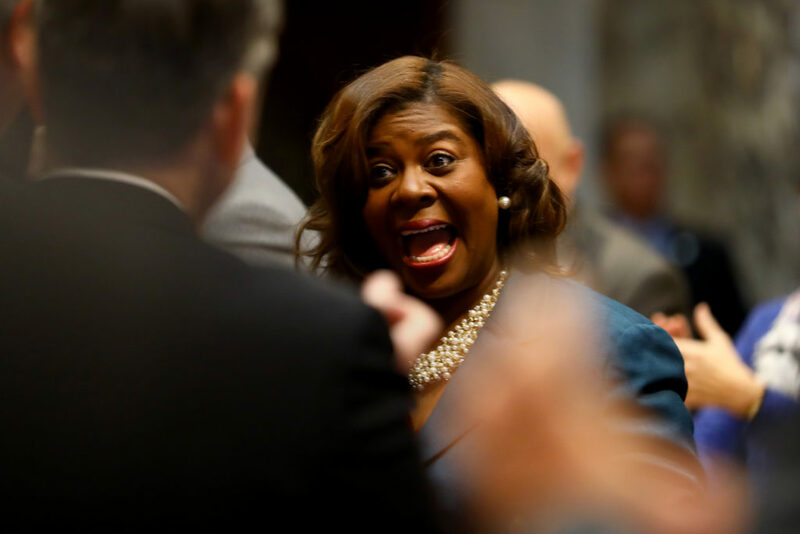 In the summer of 2015, Goodwin was sued by a debt buyer she had never heard of, Jefferson Capital Systems. The company had purchased her debt, which originated from an online school called The College Network. Goodwin is settling the case with the help of a pro bono lawyer. 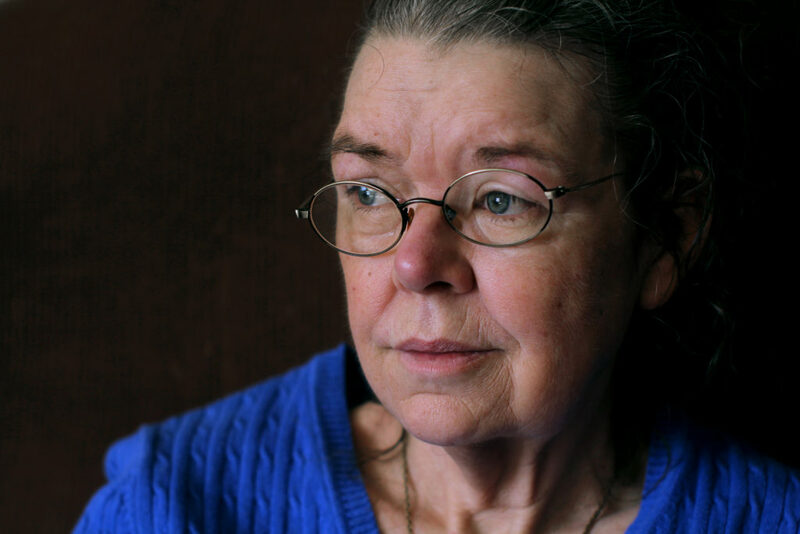 She says she was legally blind at the time she signed a promissory note agreeing to pay for an online class, which she thought she had cancelled. 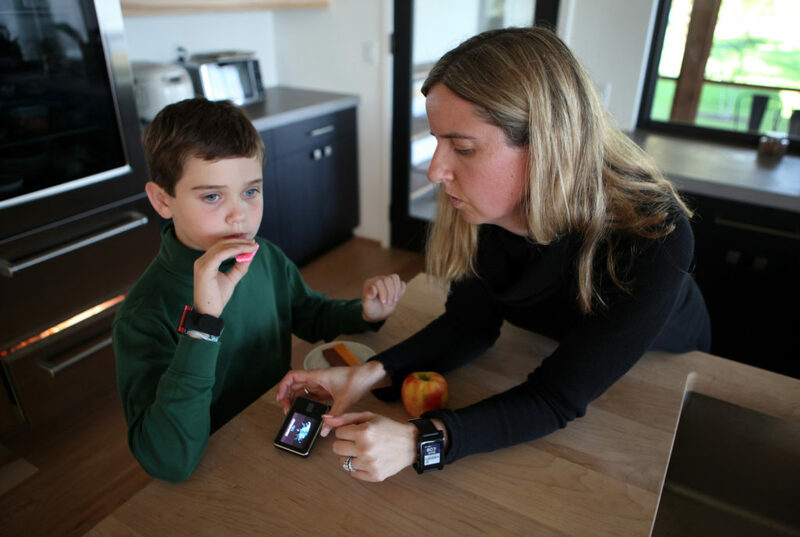 Adrian Strauss, 10, laughs while interacting with his personal care worker Bobbie Kasper at his home in Jefferson, Wisconsin. Kasper, who works for the company KPI Inc., has been working with him for two years, and provides care for him five days a week. 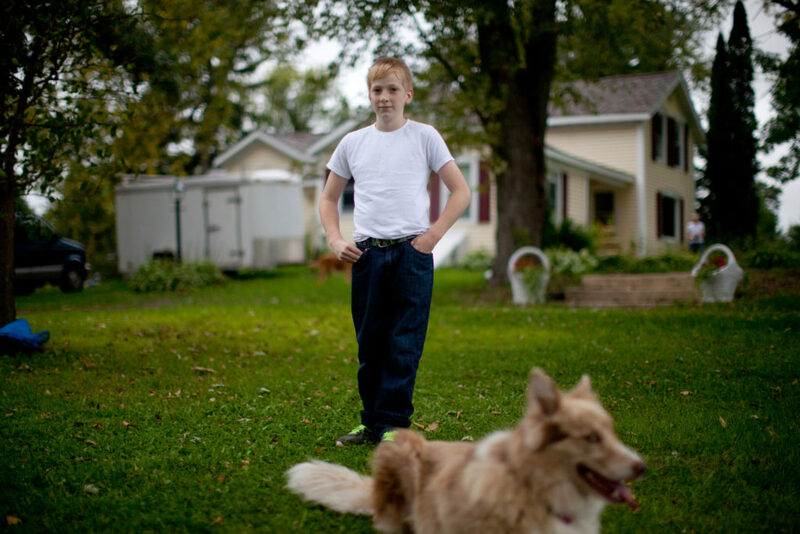 Adrian’s mom, Renetta Strauss, adopted him when he was seven. Adrian has brain damage from abuse he received as a young child. 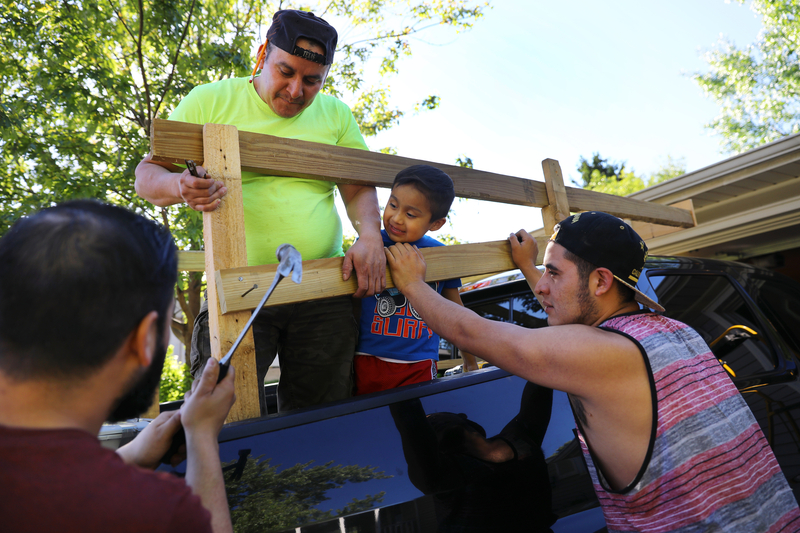 Miguel Hernandez, left, along with co-worker Pedro Tepole, center, and his cousin Eric Hernandez, build a structure on the back of Miguel’s pickup truck on May 31, 2017, to help carry their belongings to Mexico. Thomas Hernandez, 5, watches the construction project. 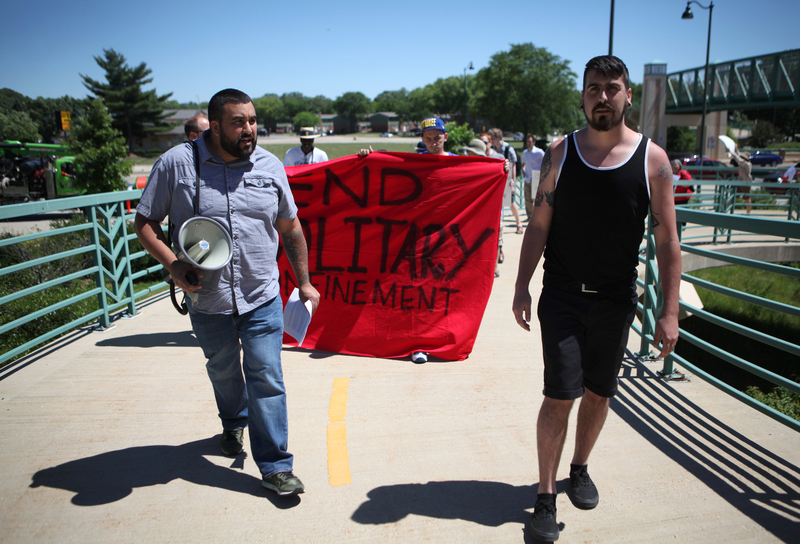 Hernandez and Tepole, along with three other dairy workers, left for Mexico the following morning. 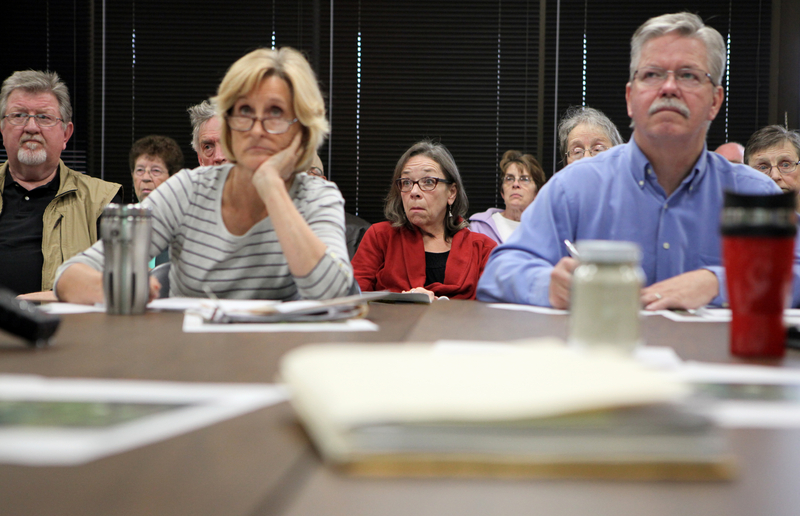 Anne Osmundson and Tom Blake are is seen at a public meeting of the Mine Reserve Expansion Study Committee Meeting is held in the Clayton County office building in Elkader, Iowa, on April 28, 2016. The committee is reviewing the environmental, economic and aesthetic impacts of Pattison sand mine’s proposed expansion. Between them is Kathy Kachel, a Wisconsin homeowner whose home overlooks the current mining site. She is reacting to a presentation given by Patrick O’Shaugnessy. Guillermo Ramos vaccinates dairy cows in the freestall barn of a dairy farm in northern Buffalo County, Wis. on March 8, 2017. The 40-year-old, Mexican-born farm manager has worked on the farm for almost 20 years. 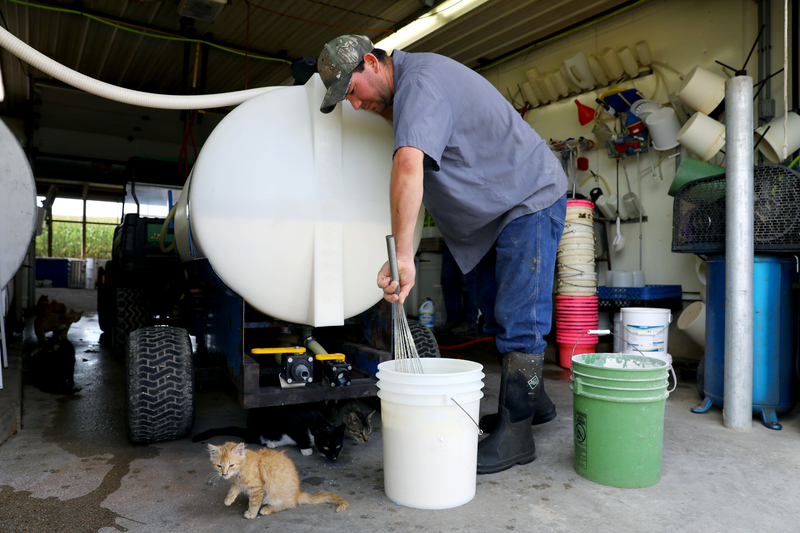 His boss, Nora Gilles, says he is integral to the operation of the dairy. 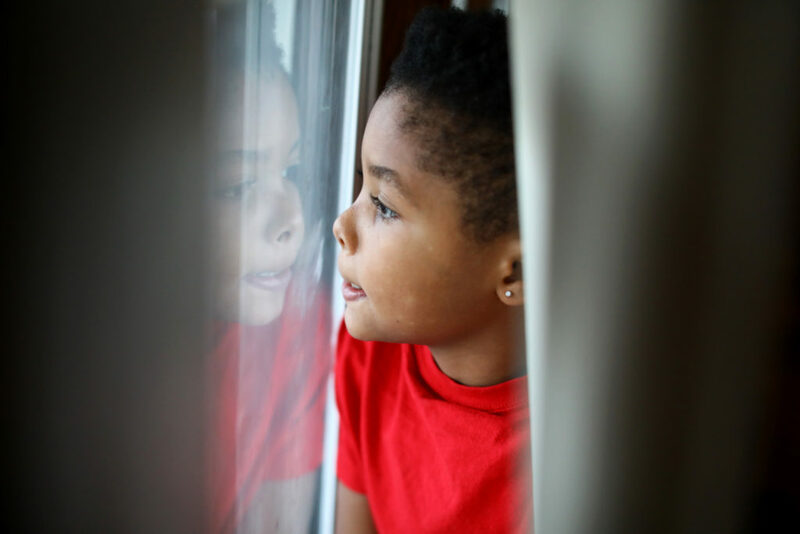 Dae’Lon Wofford, 7, looks through the curtains out to the street from their rental home in Milwaukee. The family is facing eviction in the next week or two. In Wisconsin, landlords may evict tenants during any time of the year, including during the winter. Dae’Lon is in second grade. Miguel Hernandez, left, talks with his wife, Luisa Tepole, about what to load into their pickup truck as they prepare to return to their hometown in Mexico. His cousin, Eric Hernandez, and co-worker Pedro Tepole, right, help to load the truck a little after 8:00 p.m. on May 31, 2017. Miguel and Pedro had already worked a full-shift on the Knoepke’s dairy farm in Pepin County, Wis.
Luisa Tepole hugs her son Liam at their home on a dairy farm in Pepin County, Wisconsin on March, 8, 2017. Her husband Miguel is assistant herdsman on the farm. She says her family has experienced racial slurs from people in the community since President Donald Trump took office. They are planning to join the growing flow of immigrants back across the U.S.-Mexico border. 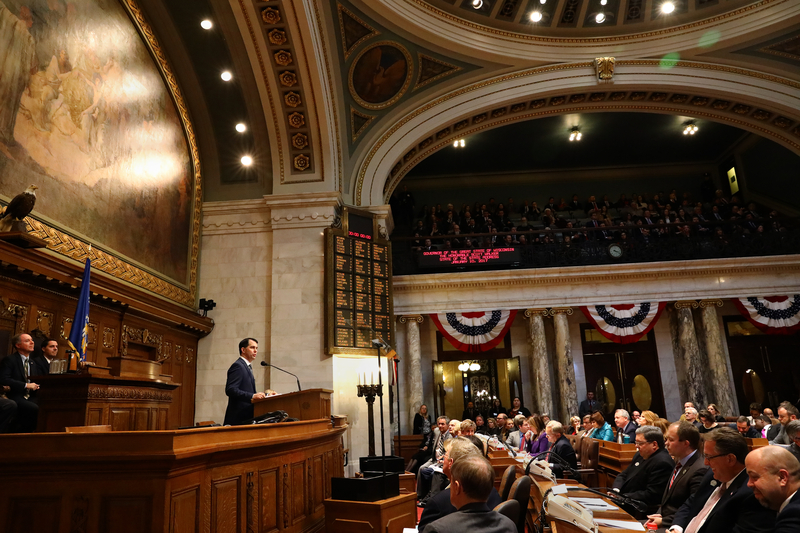 Governor Scott Walker speaks during the State of the State address in Madison. Legislators are seen at the State of the State address in Madison, Wisconsin, held at the State Capitol building, on Jan. 10, 2017. Scott Walker is the governor of Wisconsin, and addressed a joint meeting of the Assembly and the Senate. 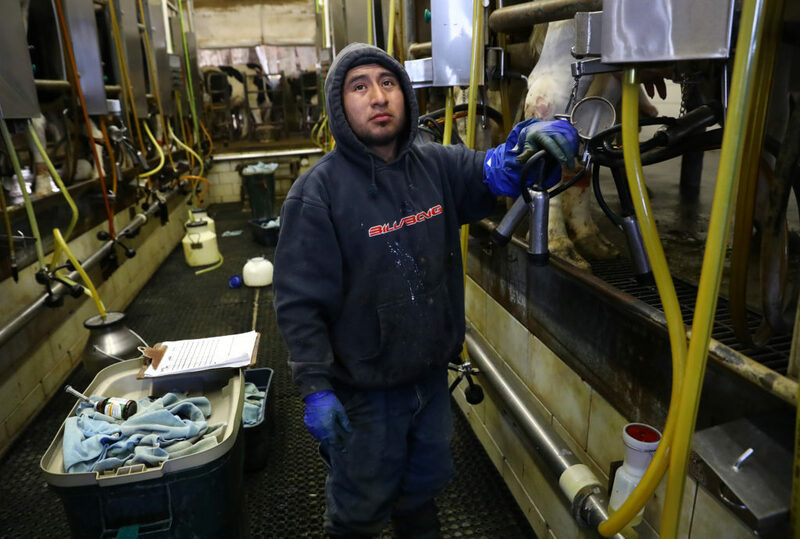 Armando, a Mexican employee at Rosenholm Farm in Cochrane, Wis, works in the milking parlor. He asked that his last name not be used because of his immigration status. 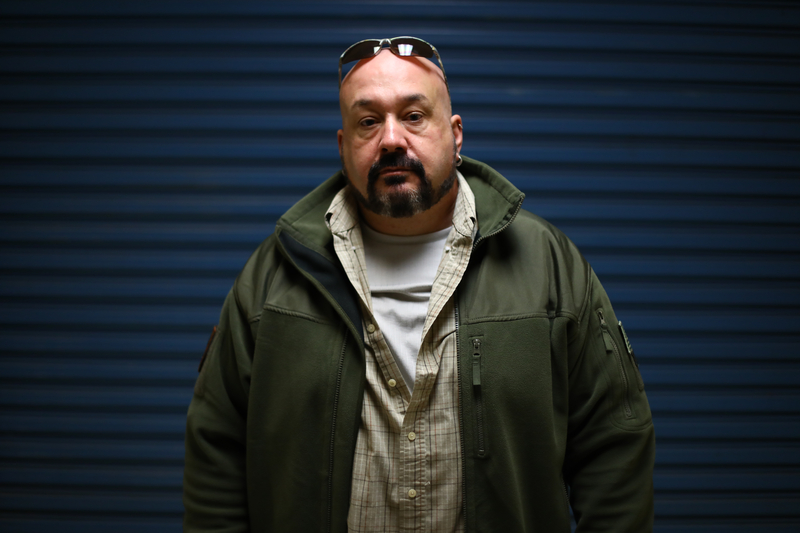 Armando is among the estimated 51 percent of all dairy workers nationwide who are immigrants. 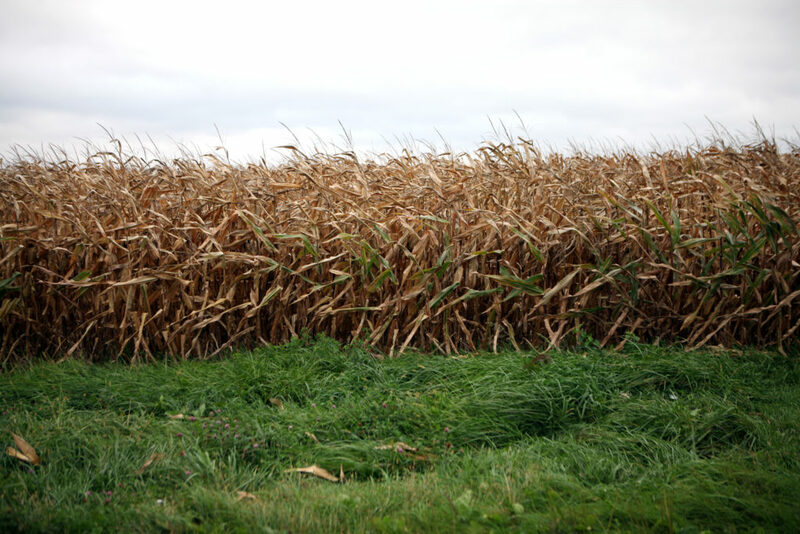 His boss, John Rosenow, says that if his foreign-born employees were deported, or decided to look for work elsewhere, Americans would lose their jobs too, because the farm would be forced to shut down. 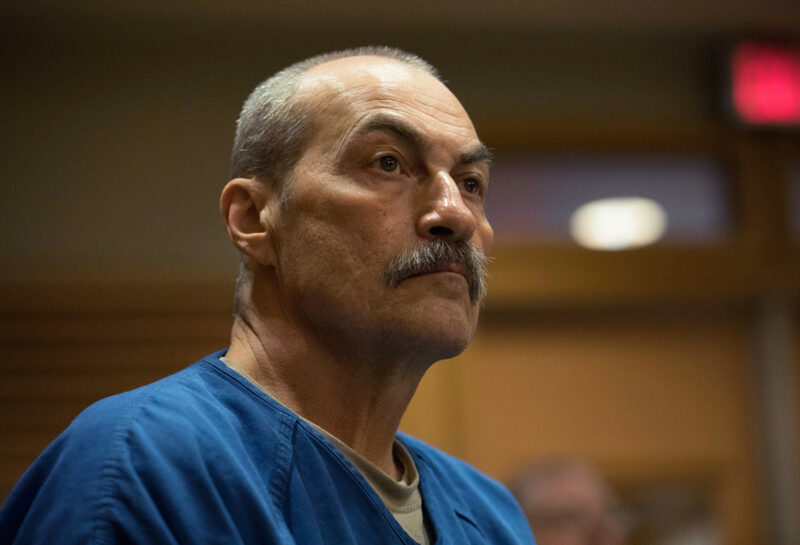 Dan Bethards was an undercover drug agent who brought allegations against former Division of Criminal Investigation Special Agent in Charge Jay Smith to state and federal authorities. He was fired in October 2013 for allegedly violating several Department of Justice rules. Bethards claims he was the victim of whistleblower retaliation. He was photographed in Madison on Jan., 25, 2017. Gov. 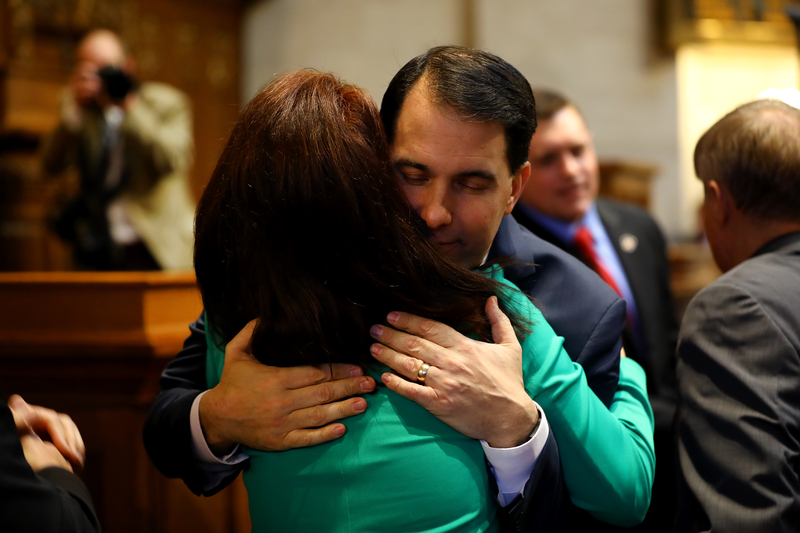 Scott Walker hugs Lt. Gov. 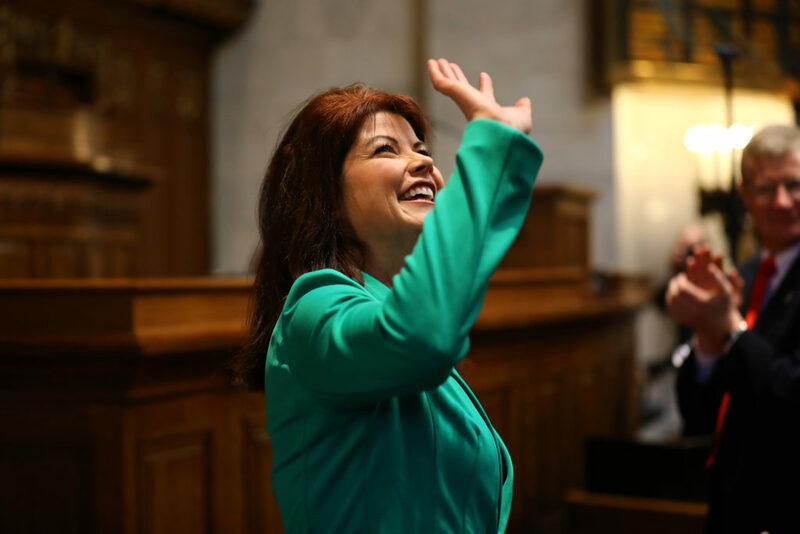 Rebecca Kleefisch after the State of the State address. Lt. Gov. Rebecca Kleefisch waves to people prior to the start of the State of the State address in Madison, WI, Jan. 10, 2017.